So, I can’t seriously be the only one who has been doing “faux calligraphy” since I was a kid, can I? I mean, it was totally unintentional- I used to just doodle in cursive writing all over all of my school supplies (sorry, Mom), and then go back with my pencil and add thicker parts to each letter. I always thought this was just how you added “shading” to your letters, to make it look prettier. Turns out I was unintentionally teaching myself calligraphy at the same time- the parts I thought were “shading” were actually downstrokes! Did you ever do this?! Tell me in the comments below and make me feel better! Just here for the free worksheet? Skip to the bottom of this post! If you’ve never heard of “faux calligraphy” before, it’s basically what you can do to create calligraphy when you don’t have a brush pen or other calligraphy tool. It’s what I use aaaaallllll the time when I’m doing calligraphy on surfaces like windows, chalkboards, mirrors, mugs- you name it! Whenever you’re using a pen or tool that doesn’t allow you to change your pressures to create thick/thins, you’ll do faux calligraphy! And, although you may have been doing this since you were a kid like me, there is actually some method to the madness- other than just adding “shading” like I thought! You can do faux calligraphy two ways- with cursive writing (if you don’t know calligraphy basic strokes), or using your actual basic strokes (if you know them!). Either way, what you’re going to do while you write your word is focus on which direction your pen is moving. In calligraphy, anywhere you’re moving your pen in an upwards direction should be a thin line, and anywhere you’re moving your pen in a downwards direction should be a thick line. 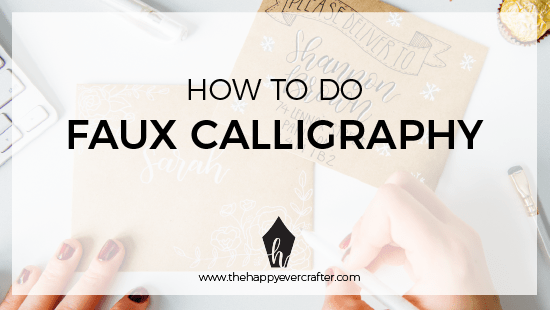 Once you understand that rule, you can apply it to your faux calligraphy fairly easily. As you write your word, simply pay attention to which direction your pen is moving. Then, once you’ve drawn your letter, go back and thicken any lines where your pen was moving in a downwards direction- because downstrokes are thick, remember?! Once you apply that rule to your entire word, you will have mimicked what your calligraphy would look like using a flexible tool, with heavy (thick) and light (thin) pressures on the pen! Let’s look at the letter ‘a’ as an example, and recap the steps. STEP 1: Draw your letter or word in calligraphy (or cursive if you don’t know calligraphy basic strokes!). Pay attention to where your pen was moving in a downwards direction. STEP 2: Go back and draw the outline of a thicker area around any lines where your pen was moving in a downwards direction. STEP 3: Colour in the thicker lines. Voilà! Ready to give it a shot? 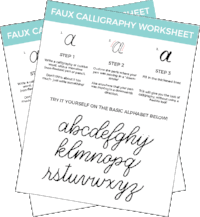 Grab the free faux calligraphy worksheet below! You can use any writing tool- seriously! Even a pencil will work! Find this post helpful? Have questions? I’d love to hear from you in the comments! It is really very helpful !! Like whenever you want to do calligraphy you don’t require any extra thing..Just a pen would do. I started calligraphy in the same way as yours 🙂 just unintentionally! On my gish, I always did this. I thought I was making shadow letters. Who knew? YES!!! I totally did faux calligraphy as a kid and didn’t realize it. I also thickened random flourishes on post it notes before I even knew what flourishes were! 😁 too funny! I am still starting this calligraphy gig on my free time. (usually during the weekends) Thanks! Thank you for sharing this work of yours. It will help me alot to learn calligraphy. Oh my God ! Literally I have been doing this all my life, yet there is a name to it. Thank you so much for sharing your knowledge and educating others by this. I am absolute in love with all your works and videos. Thanks again for the work sheets. I am so interested on working with those..
It’s really very helpful…Thnaks for sharing this video surely i’ll subscribe your channel love….thnak you so much!!! Yes, I tried to make my paper textbook covers look more stylish. I would try and copy examples from the German text I found in dictionaries. It was a total mess, so I gave up. I see that you can do, and really is a great job, congrats!! I’m so happy I found your YouTube channel and subscribed 🙂 I’m ready to try my practice worksheet, but I’m excited about the course coming up in October!! I’m finally going to learn how to do lettering/calligraphy correctly! Thank you so much! thank you for the amazing tools you have provided! i just recently starting journaling again and i loveee these for headers etc. Thank you for your video.you made it look so easy and fun!! Very useful for learning calligraphy. Where did you get your pens from? Another great tutorial, thanks Becca!